With Facebook’s fourth-quarter earnings call set for Wednesday, Jan. 29, digital marketing company Kenshoo provided a look at its analysis of more than 115 billion fourth-quarter ads on the social network, in infographic form. Impressions rose 51 percent compared with the third quarter of 2013. Clicks were up 66 percent. Click-through rates jumped 10 percent. 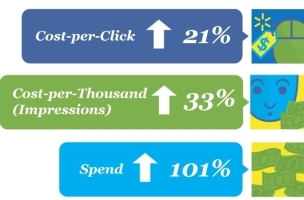 Advertisers’ cost per click rose 21 percent. CPMs (cost per thousand impressions) were up 33 percent. Ad spend more than doubled, rising by 101 percent. Advertiser revenue saw a 60 percent gain. Readers: Did any of Kenshoo’s findings surprise you?